Cooking for one is extremely boring and is not always easy to do. Not that I feel any different even when H is around sometimes! I made French toast for brunch today. This is a great way to use up stale bread. It is very easy and takes all of 10 minutes to prepare. This is so simple that it doesn't really need a recipe, but I know that this would be really useful to my sis who is looking to add to her growing collection of simple and quick recipes. Break the eggs into a wide, shallow bowl. Add milk, salt, pepper, chopped onions, scallions and semolina and beat well with a fork. Meanwhile, in a large non-stick frying pan, over medium heat, melt the butter. Dip both sides of each bread slice into the egg-milk mixture till the bread soaks it all up. Cook until both sides are browned and the eggs have cooked through. Serve hot with some tomato ketchup. Ketchup just makes everything taste so much better! I sometimes make a sweet version of this by adding some sugar and vanilla essence to the egg mixture and omitting the green chillies. However, I prefer my breakfast/brunch a little spicy and savory- Indian ishtyle! I do the same thing minus the semolina...what a wonderful breakfast to start your day! LOOKS GREAT. Still dont know why its called bombay toast. I have lived there all my life but never eaten it. Could be one of the street foods which we were not allowed to eat. Seen many versions and urs looks great. Hmmm.... Intresting. I never knew that a savory version of french toast existed. I have always done only the sweet one. Your indian style of french toast looks so good. Thanks for the great idea. The Bombay Toast looks delish! With so many yummy and delicious dishes under your belt, it is so hard to beleive that you hate cooking! Now that's my kind of breakfast! What an appetizing picture this is. Lovely looking French toasts TBC! Yes we Indians like food on the spicy side.. cant have sweet things for Breakfast can we? What a nice post for your sister ,to start off with her cooking expermients :-) We all began one day like that, did'nt we! Left you a vm. Will catch you later. I agree with you on this quickie! Great dish T, quick and simple! Am gonna try this one very soon, am all by myself this week. wow this looks delicious! I must try this! Yep, cooking for one is boring... :) French toast looks lovely, I prefer the savoury variety as well, my version doesn't have any semolina though, will try it this way next time. tbc..thats a simple yet tasty looking one! Delicious. I love indian toast like this. hmm.. what does the semolina do in this? i don't normally add that.i make the sweet version with elaichi and milk and eggs. 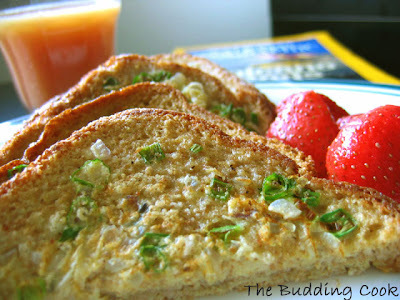 I love this Masala toast infact i make this v often for brk fast. This is my son's favourite weekend breakfast.Your's look so delicious ans yummy!! U are such a darling sis. I am sure she is proud of u. As for how the name came about, maybe it's cos it's is a very cheap, quick and common preparation sold by the food hawkers on the streets of Bombay. I believe this is also known as "anda-pav"
Red Chillies- I know! I think my newfound love of food and cooking is just so I can take pics and blog about it. Sometimes when I am not in the mood to blog or do anything, I am also in no mood to cook! Sad state of affairs, na? Seema- yeah, I 'm not too fond of sweet stuff for BF though I do have a sweet tooth. My sis hasn't even seen the post yet:-( I have to beg her to "visit" sometimes! How's the catering business coming along? Sig- You know, adding semolina did not even make a difference to the end product. I should add more maybe. I was looking for a crispy crunchy exterior! Srivalli- thanks for stopping by. so:-(...very sad, na? My whole family is like that! Nobody cares! Maybe I should add more the next time or just sprinkle it on top of the bread while cooking instead of adding it in the eggy mixture. I have never used semolina in my French toast before....will make it more crunchier, right? By the way, will try your version of cannellini bean soup..have some of those beans on hand..
And it's nice to see u here...finally!!!! Poonam- I used it 'cos I thought it would, but I obviously did not use enough. Anyway, in this recipe the addition of rava did nothing for the toast. I've heard of this only through my husband. Will definitely try this for him! Sounds amazing. I could eat Indian style everyday. Thanks for this recipe. wow ! looking at the picture, makes me feel hungry. that is my kinda breakfast. thanks for sharing dear. Hi TBC (love the name BTW), amazed at the idea of the rench Toast. My daughter loves the old version; This will add a new delicious twist! Lucky little sis...we are 3 sisters & are constantly swapping recipes too! Great post this, & the caramelised onion dip one too. Thanks for dropping by my blog!! Cooking for one does get monotonous after a point! Ooh, and you just blogged about one of the most popular desi weekend b'fasts :). Actually, why only b'fast, this would make a satisfying evening time chai+dinner too :-D.
Cynthia- Don't even get me started on the ones you dish out. Each and every one is a visual delight! I love french toast. This is sucha wonderful idea, never struck me to adds scallions and chillies etc and make it indianized. Thanks for sharing, my family would love this. Sunday breakfast is going to be this one. I made this for MBP this time. It was awesome! !